While reading over the PSA message boards, there was a thread talking about a stunning Allen & Ginter card. Not the new Topps version of Allen & Ginter, but an original 1887 Allen & Ginter card, one of the first tobacco card sets ever produced. This card is by far the sweetest looking Allen and Ginter card I have ever seen. It looks like it came out of a new Topps pack today! Mike Kelly was what some consider to be the first star of professional baseball and is a member of the Baseball Hall of Fame. 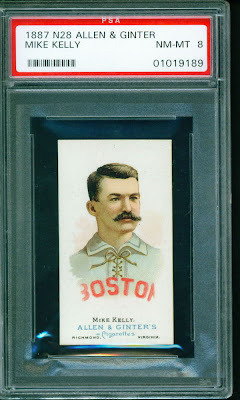 Kelly was the highest paid player in Baseball in 1887 with a staggering "salary" of $5000. Since no player could make over $2000 a year at that time due to salary cap limitations (what a novel idea), Boston got around it by giving him a $3000 endorsement bonus. Kelly would later be the subject of both a song and a movie, both titled "Slide, Kelly, Slide". "King" Kelly was known as one of the best defensive catchers in baseball and was among the league leaders in most offensive categories almost every season. He was credited with inventing or popularizing the hood slide, the takeout slide at second to break up a double play, the catcher backing up 1st base and the hit and run. He would sometimes cheat, including running directly from first to third if the umpire wasn't watching, tripping baserunners or intentionally letting a fly ball drop to get an easy double play. My favorite story from the Mike Kelly wikipedia article talks about how Kelly was on third and another runner was on base behind him. They ran a double steal and Kelly stopped just before he got to the catcher who was waiting to tag him out. The runner behind him slid under Kelly's legs into home plate, thus scoring the winning run. That play would lead to a rule that still stands today where a runner cannot pass another runner on the base paths. I talked to the owner of this beautiful card, and they have graciously allowed me to post a scan of the card here. I am also including a link to the card which has a much larger scan, and in case you are interested in adding this beauty to your collection.